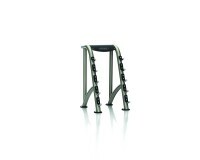 Upright design provides convenience for barbell accessories. Rack holds ten barbells, five per side. Chromed racks provide lasting commercial finish. Offset angle prevents wrist strain when removing and replacing dumbbells. 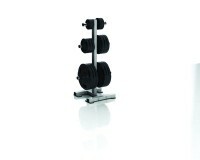 Individual cradles improve racking of dumbbells. Storage space for ten pairs of any size dumbbells. Nine chrome-plated storage horns for Olympic plates. Rubber bumpers on horns protect frame finish. 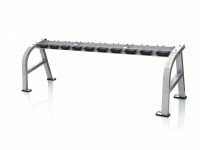 Ergonomic design positions heavier plates further off the ground for easier removal and replacement. Facilitates placement of all accessories in one spot for convenience and a clutter-free facility. 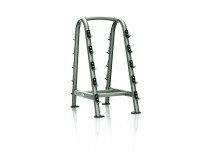 Chromed rack holds five bars, while five accessory rings can hold a multitude of grips and straps. Top shelf holds additional accessories. Storage space for 10 pairs of pro-style dumbbells of any size. Offset angle prevents wrist strain when removing and replacing dumbbells. 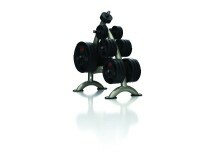 Storage space for 15 pairs of pro-style dumbbells of any size. Offset angle prevents wrist strain when removing and replacing dumbbells.